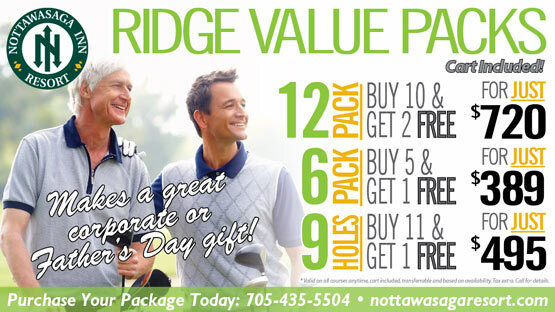 The 27 holes of the Nottawasaga golf course are set within the natural beauty of the Nottawasaga Valley. Comprised of three 9-hole golf courses, Green Briar, Valley, and Briar Hill, the winding Nottawasaga River perfectly accents the picturesque landscape of mature trees and manicured greens. 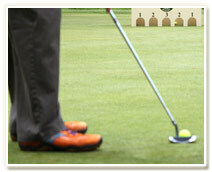 The Green Briar golf course is the longest of the three nines and features two beautiful, pond-guarded par 3's. One notable hole to pay attention to is the 177-yard, par 3, Green Briar #5. One of the most aesthetically pleasing holes on the entire course, the slightly sloped green is framed by a mixture of mature deciduous and coniferous trees and protected by a pond. Do not let the beauty of this hole distract you, as the pond in front of you and the out-of-bounds over the back will greatly punish an errant tee shot. The Valley golf course is a secluded layout with narrow fairways winding through mature cedar trees and the Nottawasaga River. There are a number of outstanding holes, but one of the best is the 356-yard, par 4, Valley #9. A visually stunning hole with the resort in the background, the Nottawasaga River runs along the left side with a treed embankment on the right. The white tees are elevated, encouraging golfers to go for the green in one shot but errant shots will find themselves lost in the expansive water hazard. A true test of skill awaits those brave enough to take it on. 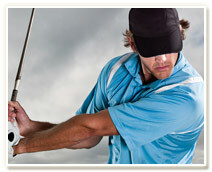 The Briar Hill golf course offers tree-lined fairways, significant elevation changes, and large, tricky greens. The signature 165-yard, par 3, Briar Hill #4, offers golfers magnificent views of the Nottawasaga Valley from the 45 foot high elevated tee. Golfers will need to take strategic shots as the large, undulating green is surrounded by numerous traps, protected by cedar trees on the right and the river on the left. 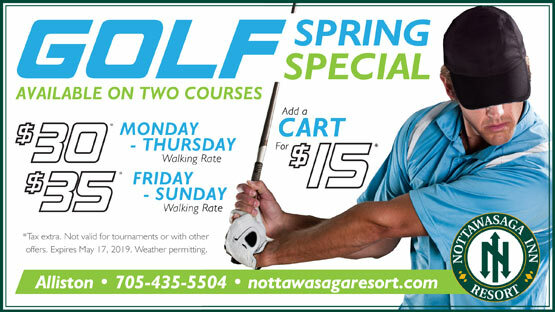 Featuring a perfectly manicured layout and easy walkability, the Nottawasaga golf course has been designed to accommodate all levels of golfers, offering three sets of tees on all 27 holes.